Hello! I'm sorry I haven't done an update in a while. I've been working on classes and everything related to classes: abilities, skills, spells, combat...you know, the good stuff. For the past several months, Josh and I have been refining the designs for the non-core classes, the classes that are most unusual, classes like the chanter and the cipher and one of my favorites, the monk. Monks in Eternity are different than you might expect. There are no restrictions on armor and weapons – you could wear plate and use a sword, if you wanted to, and the talent system is flexible enough so you could build a great monk that specialized in that gear. But at the core of this class is a little rule about how monks take damage. You see, when a monk gets hit, only part of the damage is inflicted on him or her immediately. The rest is redirected to a Wound, which is an effect that causes damage over time (called a DoT effect) to the monk. That slowly-ticking Wound would only seem to be delaying the inevitable result except for one thing: the monk can get rid of that Wound by using special attacks. Torment’s Reach - this ability increases the range of melee attacks by 200% for a short duration. Enemies between the monk and his or her target are also attacked. Costs 1 Wound to activate. Turning Wheel - if the monk suffers from a DoT effect (including Wounds ticking down), he or she adds a proportional fire bonus to his or her melee damage. This is a passive ability which works automatically whenever the monk has any DoT effect. Clarity of Agony - when used, this ability cuts the duration of hostile status effects in half. It lasts for a brief amount of time, halving both incoming effects and ones that are currently on the monk. Costs 2 Wounds. Each of these attacks makes monks stronger in battle, and many also consume their Wounds, hopefully before those Wounds have done the damage the monks were originally supposed to take. And as monks level up, they get more than just these special attacks. They can gain room for more Wounds, so they can have more of them at once to use at the same time for an extraordinarily powerful attack or use them across multiple special attacks. Monks can also change how their Wounds function. For example, they can choose to have their Wounds do less damage at the start and more at the end, so getting rid of them faster is advantageous. Monks can also choose to do their damage sequentially, letting the monk build up a lot of Wounds to fuel a crazy powerful ability and not take much damage for doing so. 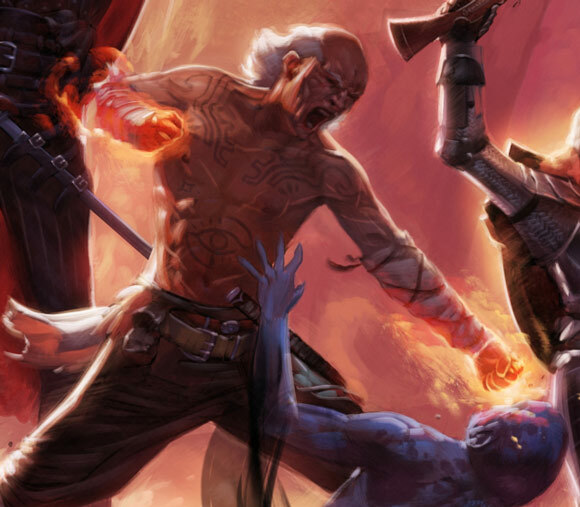 So as a monk, your goal is simple: you want to take damage, so you get Wounds, so you can perform extraordinary attacks. But remember when I mentioned the monk in plate mail using a sword? Sure, you can do that, but that plate armor will inhibit your ability to get Wounds, which means you don't get as many special attacks. And unarmed attacks are among the fastest types of attacks, so a weaponless monk can get rid of his Wounds faster than any armed monk, so he will suffer very little of their damage-over-time effects. That's like having extra hit points for free! FOR FREE! Who wouldn't want that?! This is why you see a lot of unarmed and unarmored monks running around. Not because the rules say you can't use those items, but because in most situations it's one of the best ways to play. An unencumbered monk can be a terror on the battlefield, a nightmare that just won't seem to die, no matter how hard he gets hit. Blows that seem like they should kill him only serve to make him stronger. Trust me, you are going to love playing a monk. But if you ever feel the need to use a magical sword for its raw damage potential or wear enchanted mail to gain fire resistance for battle with a dragon, you can do that too. 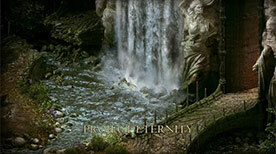 Because Project Eternity is all about bending the roles of each class, so you can play how you want, resolve conflicts how you want and solve problems how you want. After all, this is *your* game. 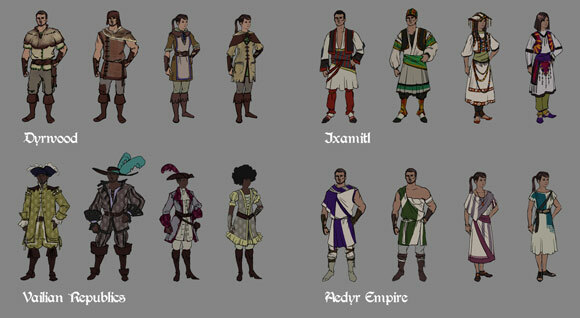 Concept artist Kaz Aruga has been developing the look of some of Project Eternity's various cultures. 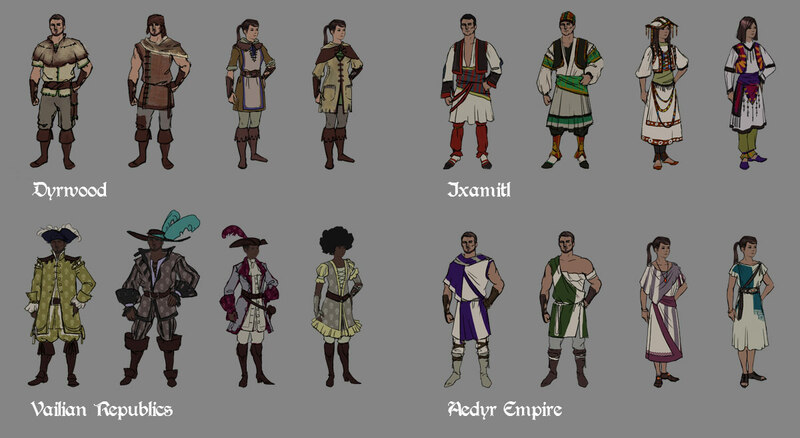 So far, he's created concepts for people from the Dyrwood, the Vailian Republics, the Aedyr Empire, and the Valley of Ixamitl. We hope you like the range we've come up with. Let us know what you think!